Early on in this 1948 film directed by John Huston, Howard (Walter Huston) talks about how the search for gold ignites an all-consuming fire inside a man, his greed always wanting more, never satisfied with his original declarations of what would be sufficient. While the man just wants to take the gold, the desire for the precious metal takes his soul. 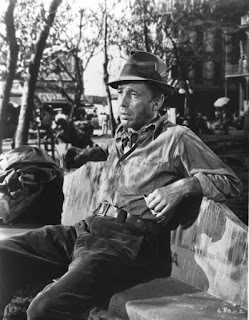 But, Dobbs (Humphrey Bogart) questions if the gold changes a man or whether the man is already soulless. The movie explores these arguments by following three men who go off prospecting together. We find Dobbs broke in a Mexican town. 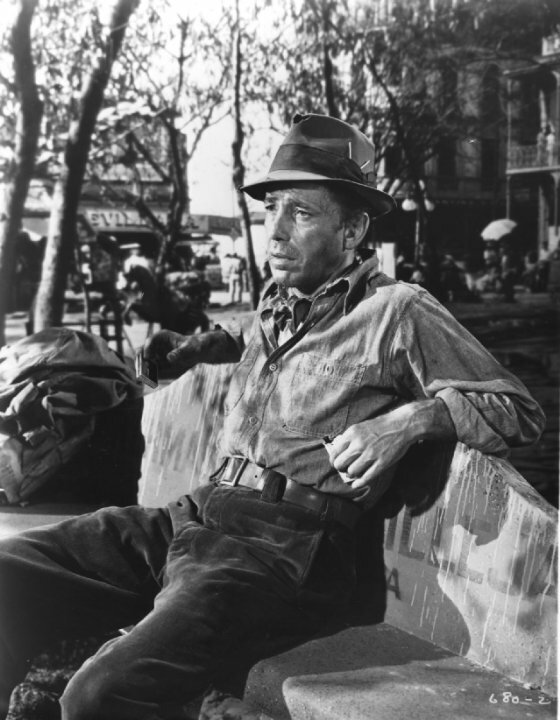 Shots are more important than words many times in a screenplay, and the look of Dobbs coveting a thrown away cigarette in the street conveys how destitute he is. He begs for money, and receives gold coins three times from an American (John Huston). The gold currency emphasizes for Dobbs what he doesn’t have, and what he needs to get in order to be on the other side of the begging situation. However, when he cleans himself up with the money he received, he dismisses the Mexican boy who tries to get him to buy a lottery ticket. So, we can see immediately that Dobbs is a taker, not a giver. He succumbs to the boy’s persistence, purchases the cheapest ticket, and eventually wins a small amount on the number he thought would be unlucky, thirteen. He now feels himself to be fortunate, and uses the money to help buy the gear and supplies needed to search for gold with Walter and another impoverished American by the name of Curtin (Tim Holt), who joined Dobbs doing some strenuous work for a cheating boss. 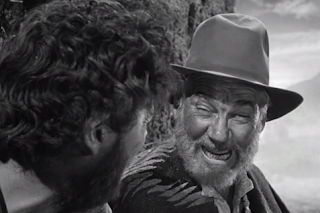 These early scenes demonstrate how poor these men are, and why they would go to extremes to better their lot in life. As it eventually turns out, the lottery number is not lucky for Dobbs. Walter is an older man who caught the gold prospecting bug a long time ago. He knows the pitfalls of the greedy pursuit, has gained and lost fortunes, and continues on these type of adventures anyway. But, he has a philosophical way about him that tempers the search for wealth with an enjoyment of the prospecting itself. He says they want to go where few have traveled since that is where undiscovered gold most likely will be. But, this fact also means that they must go where there is no civilization, where there are bandits and the dangers of being out in the wild. There, they are tested to see if they can maintain their humanity. Dobbs is surprised how difficult the trip is. He is not prepared for this trip. He can’t even saddle his burro properly. He thought it would be easy money. As he says, he expected that he would just pick gold nuggets off of the ground and bring them to a bank. Instead they have to dig a mine and rig up a water stream to flush out gold dust. Howard had said before that gold was valuable not because it was rare, but because it represents how much work so many men performed to find it and dig it up. Obviously, Dobbs’ personality does not allow him to appreciate the scarifies he must make to get what he wants. He and Curtin find pyrite and think they discovered large chunks of the precious metal. But, Howard points out that it is just “fool’s gold.” Perhaps the desire for huge amounts of wealth is a foolish mission, instead of seeing what is really important. When they wash off the sand to see better what they think is gold, Howard points put that water is more valuable than what they seek under the circumstances. A very revealing scene about the characters in the story takes place when they talk about what they will do with their fortunes. Curtin remembers how much he enjoyed being on a peach farm when he was younger where people liked being around growing things, and thinks he will become a fruit farmer. Howard says he will be done with prospecting and maybe open up a hardware store. Each sees himself content immersed in a simple life. Not so Dobbs. He sees himself relishing a life of excess. He will buy the most expensive clothes, and order everything on a fancy restaurant’s menu. He will then send the food back as unacceptable, even if it is excellent. Dobbs is an example of the corruption of wealth on those who use it to lord it over the less fortunate. Dobbs’ greed starts to warp his mind. He sees treachery wherever he looks, thinking that the other two men want to steal his stash, He refuses to go into town for supplies because he is paranoid about being away from his gold. 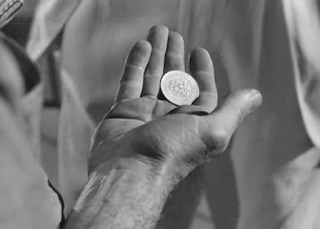 His lust for the metal makes him want to divide up the gold as they acquire it, unlike the trusting Curtin, who says they can get their portions when they finish their work. Dobbs begins talking to himself about the conspiracy against him. Even though Curtin saved Dobbs’ life in a cave-in, Dobbs greediness has poisoned his mind and he thinks Curtin is after his portion of gold. Curtin goes to town instead, and another American, Cody (Bruce Bennett), follows him back to the prospectors’ camp. He wants to become a partner. He is a guest for the night, but when Hobbs wakes up the next day, he accuses Cody of stealing their water. Cody says he thought he was among civilized men. Dobbs then says “Who’s not civilized?” and then precedes to show how he has become uncivilized by punching Cody. Dobbs convinces the others to follow him down the barbaric path by saying that Cody is a threat who will make each of their future shares amount to less, and who may divulge their luck to claim jumpers. 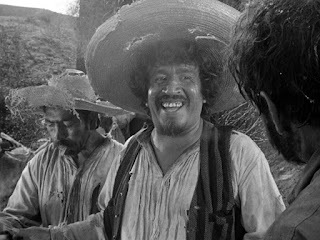 The three men are ready to shoot Cody when bandits, who say that they are government soldiers, led by a man they call Gold Hat (Alfonso Bedoya), whose name signifies the same desire for wealth, attack them. 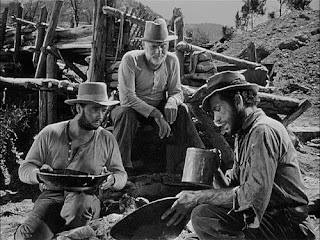 Gold Hat’s famous line that they do not have to show “no stinking badges” points to the absence of civilized laws in this wilderness where selfishness reigns. 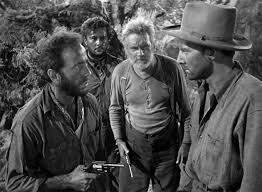 The bandits kill Cody while he is, ironically given what the prospectors have planned for him, helping to defend the other three. They discover a letter from Cody’s wife which says he was a poor farmer with a child. She misses him. Her words annunciate the theme of the film. In the letter, she says, “No treasure, no matter how great, is worth this separation.” Their love and family are worth more than gold. 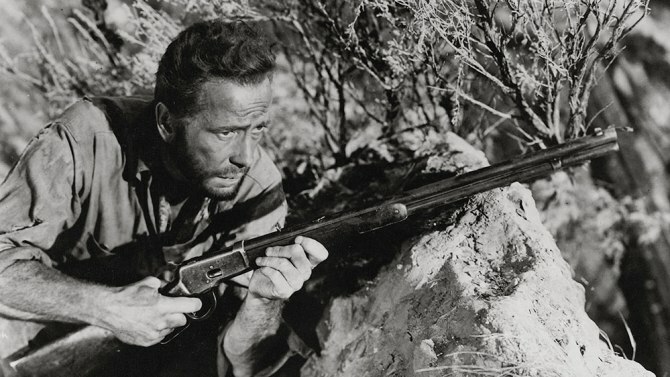 She has decided that they, “already found life’s true treasure.” But the selfish Dobbs, only thinking about his own skin, responds to Cody’s death with the complaint that now they have “one less gun” to help fight off the bandits. In contrast, Howard and Curtin’s response is that they want to give up a portion of the gold to Cody’s widow. The real Mexican soldiers show up and drive off the bandits. Some villagers seek help from Howard, who has some medical knowledge, to save a boy who is unconscious after almost drowning. He saves the boy, and the tribe requires that he accept their hospitality, or else, they believe, the spirits will be angry. Howard goes off with the villagers, trusting the other two men to take the burros, supplies, and the gold to Durango. Dobbs at first gripes that they have to be burdened with Howard’s belongings, but then proposes that they take his gold. Curtin says he will protect Howard’s share. Dobbs then thinks that Curtin wants it all for himself, and shoots Curtin. He thinks the man is dead, but Curtin drags himself off. Dobbs must now confront his demons, trying to quell his conscience, afraid to bury Curtin, fearing that his accusing eyes will still be open. Huston then provides an image of Dobbs’ camp fire building to a symbolic raging blaze, indicating the hell in which Dobbs now resides. On his own, Dobbs looks exhausted and ill from the toll the trip to Durango takes on him. His greed was about getting gold for himself, and now all he has left is himself, with no help from others. He runs into the bandits again. He doesn’t mention the gold, and says he is on his way to sell the burros. Gold Hat recognizes him as one of the men who shot at his gang, and he then kills Dobbs with a machete. They dump the bags of gold dust, thinking they are filled with sand that will make the burros seem heavier, thus fetching a higher price. When the bandits reach town, the brands on the animals’ hides show them to be thieves. They are executed by the soldiers. So they, along with Dobbs, are examples of how self-destructive greed can be. They are the ones whose ways are fertile soil for greed to grow and take over their souls. Curtin and Howard, although desirous of wealth, hold onto their civilized humanity. Howard is living a life of ease as the villagers pamper him. 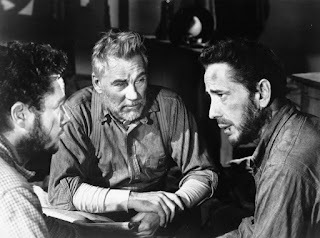 The villagers come across the wounded Curtin, and bring him to Howard, who, with the help of others, nurse him back to health. The idea that “it takes a village” of people for all to get by in life is illustrated here. 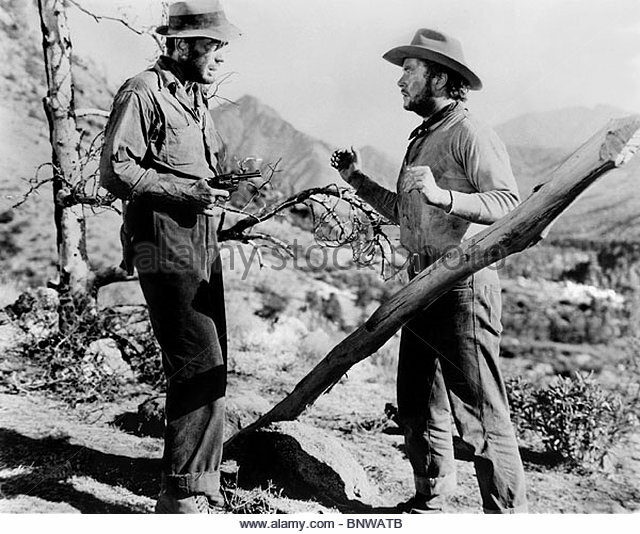 The two men learn that Dobbs was killed. They go to the site of his death in a wind storm, and all the gold has been blown away. Howard laughs heartily, seeing it as a big cosmic joke, where their folly has been exposed by the universe. Earlier, Howard said that they had to fill up the mine they dug because they must heal the wound in the mountain that they inflicted. Now, at the end of the tale, nature has taken back what the men thought would bring them happiness, but which obscured what was really precious in life. Curtin gets the message, and joins in the laughter. He will go visit Cody’s widow, maybe becoming a farmer there. Howard will live a happy retirement in the embrace of the worshipful villagers. Their last words are to wish each other “luck” – not as for monetary gains but for what really counts in life. 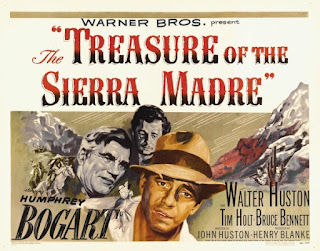 The title of the film emphasizes that the “treasure” belongs to the land, not men, and that humans should seek a less materialistic type of reward. Next week’s film is Syriana.